Smoked pork crown roast tastes so good and looks so spectacular on your table that it is easily worth the time and effort. 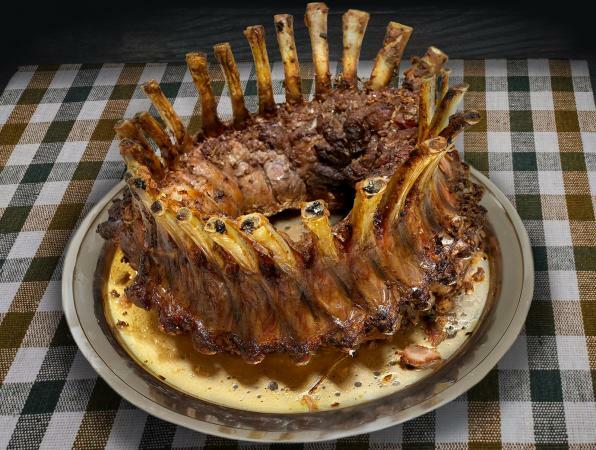 A crown roast is a rack of ribs that has been bent around in a circle so the two ends are touching. It is then sewn in this position with butchers twine so it can hold its shape while it's cooked. When the rack of ribs are prepared this way they resemble a crown, hence the name. Usually the crown roast is served with little paper booties on the end of each rib bone giving the roast a festive look. If you are planning on serving the roast decorated like this, I strongly recommend wrapping the end of each bone with foil before cooking so the paper has a nice clean bone on which to rest. People who smoke a lot of food like ribs, roasts, and sausages have smokers. A smoker is a set up that kind of looks like a large barbeque grill with a box attached to the side of it. The box is where the fire is started and, once the coals are good and hot, the wet wood chips are placed to create the smoke. These setups are usually large and can be expensive. But what if you want to make smoked pork crown roast with the grill you have already? It can be done with a little trick and a little spice rub. What you are going to need, other than a pork crown roast and a grill, is some foil and some wood chips. Soak 48 ounces of the wood chips in cool water for at least one hour. Place 16 ounces of damp wood chips in each sheet of foil. In each foil, mix in 8 ounces of dry chips with the damp chips. Fold the foil around the wood chips and seal the edges. Poke holes in one side of the packet to let the smoke out. Rub the pork with the spice mix so that every surface of the pork is coated with the spice rub. Your butcher can help you out by preparing the crown roast for you. The butcher will be glad to trim and sew the crown roast properly. Once you get the pork home, season it and let it rest in the refrigerator overnight. When you are ready to start the smoking process, take the pork out of the refrigerator and let it come to room temperature. Place coals on one side of your grill only. Wait until the coals are very hot. If you have a gas grill, only ignite one side (or the back burner). Place a pan under the side that does not have heat. A sheet pan or roasting pan will work well. Place the foil packets over the heat or directly on the hot coals. Close the grill and wait until the smoke becomes apparent. Place the pork crown roast over the pan and close the lid of the grill. Let the pork crown roast smoke for at least three hours or until it has an internal temperature of 165 degrees Fahrenheit. Once the roast comes to up to temperature, remove it from the grill and cover it with a sheet of foil. Let it rest for 10 to 15 minutes before serving.